Happy Friday. I wanted to post the card I made for our Lots of Love Blog Hop this past weekend here on my blog. In case any of you didn't get a chance to go over to the PCW team blog and to get it into my galleries. Here is view of the front of the card. I used the scalloped card and heart svg cut file as well as the Be My Valentine Banner digi set. The beautiful paper is from the DCWV Black Currant Stack. Here’s a closer look at the little heart for the easel card. I will be writing my sentiment on the heart shape. I used some doodlebug Black Beetle gems along with some Gold liquid pearls. The black die cut leaves are from the doily and rose card svg set. Here is a closer look at the scalloped heart. I inked the edges of the two designer paper mats with my black ink from the basics ink pad set. 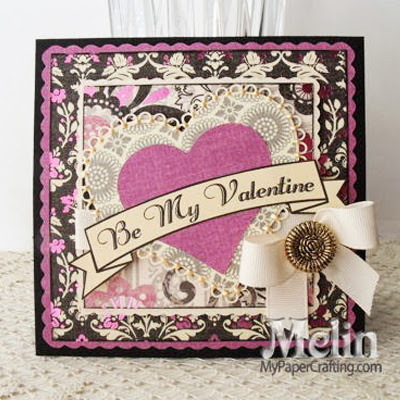 I cut out the Be My Valentine banner and adhered it to the top of my layered heart die cuts. I finished off the card with a pretty bow of some ivory grosgrain ribbon and a vintage button. Head over to the PCW DT blog and check out what Sandy created and pick up this week's free digi from PCW too! Lovely sweet card, pretty colours, love the image too..
what a gorgeous card!! you put together the paper choices/colors with your project so beautifully. I honestly would not have found myself liking the papers you used from DCWV until you put them together the way you did in this card!! fabulous :-) have a great weekend!